1. Hotels in space ... the Galactic Suite, the first hotel currently being built in space, is expected to open for business in 2012 and will allow guests to travel around the world in 80 minutes. Its Barcelona-based architects say the space hotel will be the most expensive in the galaxy, costing more than $4 million for a three-day stay, during which, guests would see the sun rise 15 times a day and use velcro suits to crawl around their pod rooms by sticking themselves to the walls like Spiderman. 2. Hotel pods ... architects have designed foldable hotel rooms that can be moved from one location to the next. The architects behind the design, London-based m3 architects, say they are "searching for a partner who can take the hotels from the current design stage and actually build it". 3. 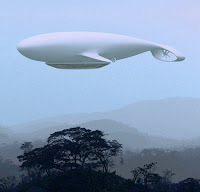 Floating hotel ... the Manned Cloud airpship is a design for a flying hotel by French manufacturing company Massaud. When finished it will be able to carry 40 passengers and could circle the planet in about 10 days. 4. Flying car ... Neil Laughton stands next to his Parajet Skycar, in which he is travelling to Timbuktu from London in the world's first road legal, bio-fuelled flying car. The Skycar drives like a car and flies like an aeroplane. 5. Sleep under the water ... the planned underwater Hydropolis Hotel under the Persian Gulf in Dubai, United Arab Emirates, will allow guests to get a true idea of the beauty of underwater life. Room are expected to cost up to $7700 per night. 6. Rocket-powered stealth ... this two-seat rocket ship will be capable of suborbital flights to altitudes more than 60 metres above the earth. The Lynx, about the size of a small private plane, is expected to begin test flights in 2010, according to developer Xcor Aerospace. 7. Super-speed travelling ... the US space agency, NASA, has successfully tested a 8,000 kph jet, the x-43A, which would allow you to fly from the UK to Australia in two hours. Plans for a Cosmoplane, the successor to the Concorde, are underway with a projected launch date of 2024. The craft, which is being developed in Russia, is intended to take off and land like a normal aeroplane but act like a spacecraft while in the air, reaching an altitude of 200 kilometres. 8. Miniature hotel ... the Yotel hotel group draws on influences of Japan, airline travel and luxury yachts as inspiration for its capsule-like cabins, and promotes itself as having "everything you would expect from a luxury hotel in a small space". The Yotels are located inside airports at Heathrow and Gatwick, London, as well as Schiphol, Amsterdam. 9. Budget hotel rooms ... hotels such as the easyHotel are increasingly looking at space-saving options and more hotels are offering miniature-sized rooms. 10. A city onboard a ship ... the Freedom Ship is a planned floating city on a massive ocean-going vessel that would continually move around the world. The proposed vessel's superstructure, rising twenty-five stories above its broad main deck, would house residential space, a library, schools, and a first-class hospital in addition to retail and wholesale shops, banks, hotels, restaurants etc. Its large fleet of commuter aircraft and hydrofoils would ferry residents and visitors to and from shore. 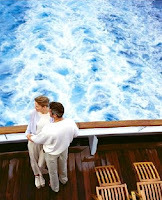 The airport on the ship's top deck would serve private and small commercial aircraft. It is envisioned as a "community on the sea" where "a unique lifestyle that allows families and individuals to work, live, and travel simultaneously" is created. 11. Body x-ray ... the ProVision whole body imaging machine can see through clothing to search for banned carry-on items. Airport officers will use the Millimeter Wave Whole Body Imaging Technology machine randomly, despite complaints from privacy advocates that the technology reveals too much of one's private anatomy to strangers. The use of this technology in airports is growing. 12. Retinal Scanning Display ... the device scans in computer images and data directly onto the user's retina to create a large, high-resolution virtual image which superimposes with real-life vision. Iris scanning technology is now being used at Amsterdam's Schiphol airport to speed up the airline boarding procedure. There is reportedly only a one in 1078 chance that two irises will be identical. The use of this technology is tipped to become widespread. 13. Pets-only airline ... from July a US company will begin flying an animals-only airline. The Pet Airways plane has furnishings such as the seats and bins removed, with animals placed in their private pet carriers and locked into a restraint system. 14. Spiral-shaped hotel ... the Helix Hotel to be built in Abu Dhabi won't have floors, instead it will spiral in sections like a corkscrew / Leeser Architecture. 15. The Hotelicopter ... thousands of travellers were excited about the Hotelicopter, with it being promoted as "the world's first flying hotel in a converted helicopter". 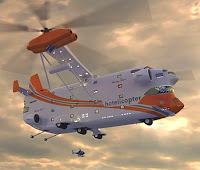 Although it turned out to be an April Fool's hoax, the idea of building a hotel inside a giant helicopter may not be that far-fetched when considering how much travel has changed.